These Q-Connect polypropylene folders can hold up to 150 sheets of A4 paper and feature a press stud closure to help keep contents secure. 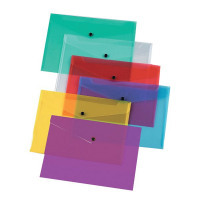 Made from durable polypropyplene, the folders are transparent for easy viewing of the contents. This assorted pack contains 12 folders, with 3 each of red, blue, green and clear.